- Patented product, MY-123721-A. Any infringement prohibited. 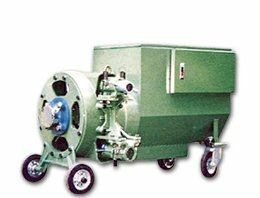 The Excellent casting mould design in rolling extrusion system allow and enhance more durability of the extruding tube, the inverter controlled system able to prejudice and safety control of the overloading issues.This machine handles a wide range of work and operates smoothly without interruption when feeding cement. The superior cyclodrive design over conventional gear tooth design with all torque transmitting parts operate in compression, allow for many teeth to share the load and enhance high pumping result with minimize exhaust of extruding tube.